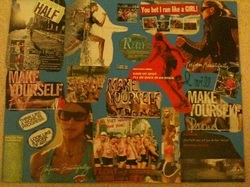 So I've decided to keep a journal while I start training for my first half marathon in January 2011. I'm really excited to do this since will be at my favorite place in the world - DisneyWorld! It has a huge emotional meaning to me since I used to go there every year with my family since I was 4 years old, so what better first race for my half to be than this! So I've put a challenge on myself to do this and also in celebration of my birthday, which is only a few days before the race. I have never done a blog before but after speaking to some friends who ask me for advice on how to get in shape and to stay consistent, I figured this would be a great way for myself but for them too! I find this being a huge compliment since I had a baby last September but I wanted to prove to myself and to other moms that you CAN get back into great shape after pregnancy - IT IS POSSIBLE!!! Even if you don't have kids but are having trouble losing weight, this is my way to inpire and motivate others. So here I go, to start training and to lose those last stubborn 10 pounds to get to my 'ideal weight'. So yesterday's workout was a little sluggish, even though I did the 3 miles I walked the last half mile, was feeling a little dehydrated. Sometimes when your body is telling you to slow down, you have to listen and take it slow. I couldn't make it to Pilates since my little one needed me to get back home! Sorry for the late entries guys, but had family in town but I'm back on it! :) So on Tuesday I ran 3 miles and focused just on my pace and my speed. 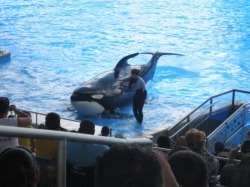 On Wednesday & Thursday I took my rest days because of family and a trip to SeaWorld :) Although I must have walked at least 2 miles in that park! Today was rough I really wasn't feeling like running since I was sad to have family leave but I knew I had to do it. So I couldn't make it out to the gym so I put my daughter in the stroller and went out for a run. It actually helped clear my mind alot but since it was so hot I only did a little over 2 miles when I was supposed to run 3. I didn't get all down about it because it was better than not running at all. Also when running with a stroller it really forces you to use alot more muscle parts then if you were running alone so that can fatigue you more too. I try to run with just one hand on the stroller but it's hard on those turns. I still love to do it because my daughter loves the view and it creates a little resistance as well. *Make sure to check out my new blog entry that I posted today, just click at the top of this page "my blog"
And when the cookie crumbles... so today was one hell of a day. I woke up with a horrible toothache from a 'not finished' root canal that I have scheduled to be completed mid August. Well, no way in heck I can wait until then so I am now on pain meds and have the appt. scheduled for Tuesday afternoon. This definitely puts a burden on my training plans but I plan to get right back on it once I am better again. Can't let it get me down right! So before my dentist appt. I thought I'd get a workout in and I did a heavy strength training session that left me sore for the rest of the day! Now after my appt. I wasn't feeling so hot, especially since they gave me a strong painkiller. So I took a day off. Well I ran 7 miles totaling about of the 3 days I worked out and I did a strength training workout yesterday that ended up me pulling a neck muscle :( Swear if it's not one thing it's another! but my motto still lives - nothing will keep me down!! I'm feeling better already but I am going to have to take a day or two off to rest. The most important thing I've learned thru all these things, is that injury will happen if you don't listen to you're body telling you to ease up or take a day off. So let's just say I've learned my lesson! 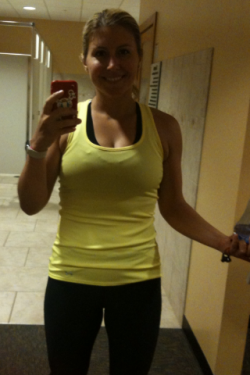 Took this pic the last day I worked out which was on Sunday, Aug. 8 - I look so serious, lol. Also, mother nature has visited me so for being bloated not too bad! I was feeling better today so I put my little one in the stroller since I couldn't do a solo run, and ran 3 miles around the neighborhood. I went in the early evening but it was still pretty hot. It's funny that I keep getting a different type of tan because of the different shaped sports bras I've been wearing, lol. Either way, I'm really happy that I'm feeling better and able to get back to my training. On the 28th is a 5K I'm really excited about because I think I'll beat my PR record by like 5 mins! So today went great! I'm back at it and feeling like 100%! I did a 2 mile run in the 90 degree heat and then did some Pilates! Good stuff :) I wanted to run farther but I was pushing my little one and it was a little too hot for her to be out too long. 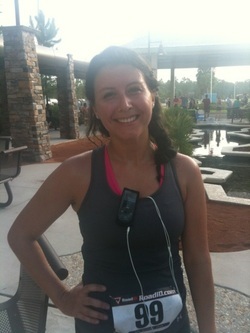 What made me happy was that I beat my time that I usually run while pushing the stroller, so my pace is getting faster! So this is kinda completely off topic here but I didn't run today and instead got my hair did lol. You might be thinking now is that any way to be committed to your training - but I thought to myself I have ran the past 2 days and I could take a day off. So instead so I didn't completely not do anything, I did an ab + upper body workout at home (thx to the lovely Tone it UP ladies). Granted I did it like an hour ago but I feel great and I ate well too today! Bonus! 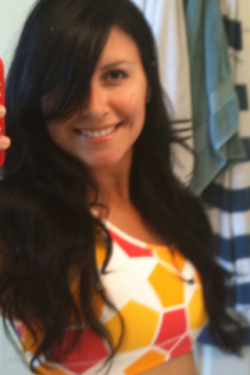 As for the hair, well I'm not used to it just yet, going from blonde to jet black is a big change but my hubby likes it and I'm hoping it will grow on me too :) Have a good weekend! So today I made a trip to my local Whole Foods store and stocked up on some goodies! 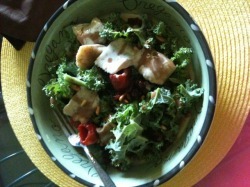 I made this amazing salad with Kale, peppers, pine nuts, herring and a little drizzle of balsamic - all organic and super healthy and it was sooo good! 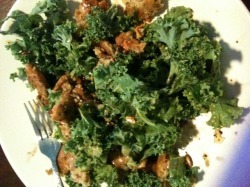 I was so proud of the finished product I took a pic for you all to see ;) I have to give a shoutout to the ToneItUP ladies on getting the Kale - I normally just buy Romaine Hearts and chop it up but I'm in love with Kale now! 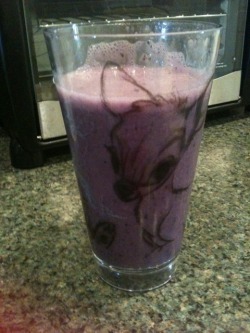 So as for my training it was a really hectic day and it stormed ALL friggin' day so I had to workout indoors & at home. So I did my ab +arms circuit workout once again and my arms are hurtin'! Not sure if I'm going to run tomorrow or just do a spin or yoga class -I let you know what I'm in the mood for tomorrow ;) Hope you all had a good weekend! OH and I had just realized I have 2 5K's coming up back to back starting on the 28th and then the following Saturday - it will be a piece o' cake! I hope to beat my PR (personal record)! So today is my 'rest' day and even though I'm not doing anything physical I thought I'd share my delicious breakfast with ya'll, lol. 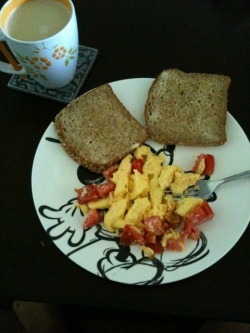 It was egg beaters with tomatoes, Ezekial bread with margarine and of course my coffee - and let me tell you it was yummmay!! Anyways my plan for the day is to take a dip in the pool and maybe do some laps in it...or just float ;) Happy Wednesday! EXCITING NEWS PEEPS!! You know how I always mention the 'ToneitUP' gals and how they've helped me in my well..everything! Well I have become part of their 'affiliate program' and they've allowed ME to post their videos, links, and their fat burning system on my blog!!! I'm really excited to share this with you guys and hope you check them out!! These ladies are amazing & look amazing to prove it!! :) So I'll be posting links around on here and feel free to browse!! Now, as you can see, I DON'T do promos for anything but this I will make an exception for b/c I truly believe in it. Here is a pic of the ToneitUP gals - Karena & Katrina! Below is a link to more info about their 'fatburningsystem' These ladies are my inspiration! 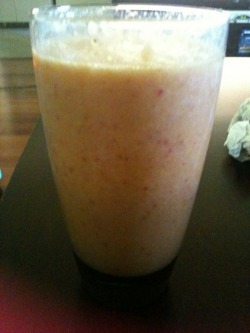 So here is a pic of a very yummy shake I made this morning along with my egg beaters & turkey bacon - it was with strawberries, oranges and almond milk. First time I didn't have coffee and I have been energetic all day :) Well it's midday and I haven't hit the gym yet but today is strength training focusing on upper body but a few lunges throw in. :) Hope everyone has a fantastic weekend! Hiya! Well I had planned on making it a rest day but I was feeling energetic so I did a plyometric workout at home and did some light yoga. The yoga felt gooood to smy muscles ;) It's been really rainy here so I couldn't do it outside so indoors with my little one laughing at me was a sight to see lol. Well I hope you all had a good weekend :) *Namaste. TONE IT UP FAT BURNING SYSTEM! Okay ladies & gents, I've gotten some emails about what exactly the fat burning system is and I got some info to share with you about it! 2 things I can tell you is that IT WORKS and that you will never have to starve, count calories, or not be able to eat your fav foods! So below is the ad about it and will be a link if you are interested in giving it a try! It will change your eating forever - trust me! So if you want to know more about it or give it a shot please click on the link below!!! Hi! Hope you all are having a good middle of the week! Today I got up went to Lululemon to get some awesome running shorts..again, lol, then ran around the beach with my littleone, then grocery shopping! It was a productive day and a nice cool breeze so my run felt great! 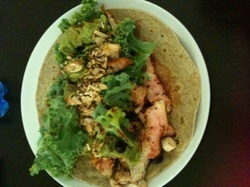 Pictured above is a whole wheat taco I made with almonds, cranberries, DeliFresh precooked chicken, kale, guacamole, and raspberry vinegarette dressing ..soo soo yummy! So It's September 1st and 3 months to the big race day - (Jan. 8th,2011) I have been running well but not doing a lot of long distance, so now it's time to step it up! I feel stronger than ever, and my endurance is getting better, so other things are improving so I'll take it! OH and ALSO! I found out yesterday that I TOOK 3RD PLACE OVERALL FOR MY AGE GROUP FOR THE 3 RACE SUMMER SERIES i JUST DID! So I need to go sometime this week and pick up my award :) I am soo excited, I didn't expect that at all, so that was pretty cool :) Anyways, I'm off to cook some dindin..talk to you guys soon! Hello! Soo Friday was my 'rest day' so therefore no entry,sorry ;) but TODAY was race numero 7 and boy was I all over the place. I slept well but once the race started which btw had 600 people, not even 10 mins. into the race I semi-fell. I was getting up on a curb to get around some people and bam my ankle rolled and boy did it hurt, but I didn't stop. I did think dang I'm gonna have to turn back but I said you know what if it hurts that bad stop but it didn't so I pushed thru it. Next hurdle - my mind - I could not get focused thoughts were rushing in and out of my brain - what's my lap time, dang I need to speed up - I need to focus on someone but can't find anyone in particular - dang my musiclist isn't doin' it for me - and so on, ALL OVER THE PLACE! 3RD HURDLE - a big@!! hill (bridge) didn't see that coming and that slowed me down...cramps, and did they hurt, a side stitch..all these things were on me this a.m. but I kept going. I stopped twice but only for a second or two and picked it right back up..my pace ended up being around 9:35-10:30s, and then my BIGGEST PET PEEVE is that I didn't see any mile markers!! I felt like mile 2 was the longest ever and then I started to recognize the loop and I was like wait a minute...and then I saw my husband..and i was like what the !!!! and then I booked it to the finish and finish I did at the same time as last week. So with all these things and I am sure I could've beat my time and I was a little upset afterwards. I am hard on myself, I admit that, but I am glad I didn't stop or turn back when I easily could've. Soo my ankle is hurting a little now and I've been icing it but it seems it would be best to take a few days to let it heal. Strength training will be my priority this week. Hope you all have a good weekend! Next one - an 8K (4.9m) on Halloween..hmm what costume should I wear ;) see ya! Sorry I'm a day behind here, I've been quite busy with my baby girl's first birthday coming up ;) Anywhoo - so yesterday I decided to see if my ankle was ok since it hasn't been hurting so I went for a run and did some fartleks..and lo' and behold its a-okay!! Yippee!! It felt really good doing sprints, I didn't worry about mileage I just did 1min long sprints as fast as I could with 20sec or so of recovery in between. When I was about done and the sun was blazin' it was a little over a mile and a half, so not bad! That's all I did today since I had other stuff I had to get to. I was sad I coudn't make it to the running club but I will maybe when my mom is in town. Well that's it for Tuesday! I woke up this morning feeling sore, and I didn't expect to since my teach told me I should be fine so i'm not sure if it was b/c my workout or the yoga -or both!?? Anyways, I took a day off on Thursday and it worked out because I had alot of family stuff going on. Soo toay Friday, I put my little one in the stroller and we went for a run and I just went at a comfortable pace and we did a little over 2 miles nonstop. It's amazing how before I would have to stop once or twice to take a quick break but today I was comfy and we kept going..felt proud ;) Well that's it for today, nothing too exciting! Tomorrow am is a FIT class at my local Lululemon Store so I hope I can make it but if not I'm sure I'll have something else up my sleeve to do ;)Have a good weekend folks! I only had about 20 mins to be able to workout by myself so I opted to go for a quick run outside - I did 2 miles and considering it was 90 degrees out, that's not bad :) I had alot going on with my mother flying into town on Monday so at least I got my quick workout in! Hello! Well sorry I've been a little behind on my updates but my mom flew into town yesterday (Monday) and I took it as a day off. Today (Tuesday) I did 1 set of Gabby Reece's total body workout and 2 sets of Tone it UP's Plyometric workout. had to be quick because today is my daughter's FIRST BIRTHDAY! So while she took her nap I worked it out fast & hard! Now when I am eating some cake tonight, I won't feel so guilty ;)Tomorrow I 'plan' on making it to spin class but I don't know if that will happen,,let ya'll know tomorrow! Happy Hump Day! So today I had a dentist appointment (teeth cleaning) and right after I went to Spin class and it kicked my bootay! We had a new instructor and even though the music wasn't great (the knockoff singers) she really pushed us to our limits and I went all the way! I know tomorrow my legs are gonna be sore! I plan on doing some yoga to give my hamstrings so stretchin' love ;) How are you all doing? I need to pick up the slack on my Lululemon Challenge - I planned on doing at least 3 new things this month, and I've only done one! Next week Paddle Fit or Cross Fit are on the menu! See ya'll tomorrow xo! Sorry my posts have been so short but my mom is in town and there's lots to do and on top of that I have my daughter's big birthday bash on Saturday so running around like crazy! BUT I'll be happy to say I still got my workout in today - did a strength training session and worked upper body and core mostly. Always get my lunges in though ;) I still plan to workout the next few days but we'll see..stay tuned !! 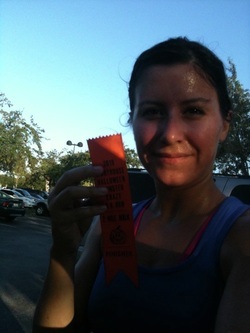 Well today was hotter than hell but I went and ran anyways, I have raccoon eyes but I don't care lol! I ran 4 miles today and it was an easy run I didn't check my pace or mileage I just ran..tomorrow is 3 miles..starting to get strict on my running plan by Hal Higdon - its a 12 week plan and I'm going to start waking up really early and running before my little one wakes so I can go it solo. Hopefully it starts to cool off so I can start wearing my warm running gear ;) Welp that's it for me, off to do laundry lol! Well I took Sunday off and it was a much needed rest, I was feeling really sore ;) On Monday I ran 2 miles since it was my mom's last day here and I really just wanted to spend all my time with her <3 Yea I love my mama! And today I ran 3 miles in between the pourdown of rain outside - for some reason I was struggling today maybe it was because I hadn't drank alot of water, or because my mom left today, or I just wanted to snuggle under the covers and be lazy, but either way I'm glad I got it in and did it -fast or not. 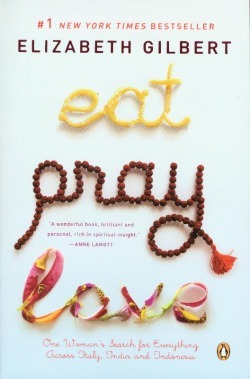 :) Tomorrow's plan? Another 3 miles :) See yaa manana! Wow! I can't believe it's Thursday already -this week has really flown by. Well today I did a 3 miler and it was really nice out, really felt the breeze from the ocean, and how I've missed it! Hope it starts to cool off ;) Tomorrow is my rest day and I am ready for one!!! I have 3 more pounds and it's been pretty consistent these past few weeks. I have been eating healthier except for a slice a pizza here and there ;) Excited to do Tone it Up's new exercise routine on Saturday which is my cross-training day. What have you guys been doing to be active? TONE IT UP WORKOUT & DVD!!!!!! Today I ran my 4 miler and it went good, it was really hot out so I took my time the first 2 laps and then picked up and got my runner's high - and how do I love thee :) Really helps push you along towards the end, my strides were wider and had my breathing in tact..not sure if I will be doing PaddleFit tomorrow but if not I'll be running another 4 miles :) Hope you all have a good weekend!! Hola!! Well today I ran another 4 miles, thank god there was an overcast which really helped me out since my shoulders are kinda burnt. Pace was pretty good I finished the last lap under 9mins, which is a first for me to do at the end! Tomorrow is a rest day, and I look forward to soaking in my hot tub and just letting my muscles relax! It's the end of the weekend, but what did you do? Anything fun? Well I think I'm going to start updating on here every few days since life has just been getting very busy and I don't have the time to do it daily, but I'll keep on it :) Sunday I did Tone It Up's bikini body bootcamp and when I woke up on Monday, my abs, buns and arms were sore! So I took Monday off and it felt good to give my muscles some rest. Today I ran but I didn't get a chance to until the evening and since it was really dark and my trail isn't lit I only got to 2 miles, I was supposed to do 3 but I didn't feel comfortable ..safety first right! Tomorrow is 4 miles and I plan on going during the day..one thing I noticed and I don't know if it was because it was so late but it was really cold! Breathing in that cold air while I was running felt weird, and when I got hom I felt like my lungs were sore..make sense? Anyways, hope tomorrow is warmer during the day...I live in the South so I shouldn't complain really but it was chilly for me ;) Here's a pic of me on Saturday after I did TIU's bootcamp workout..I was exhausted! Happy Friday guys! Well let me back up a few days and recount what I did this week :) On Wednesday I ran 3 miles which felt fantastic, went to the Vineyards and ran by the water and it was a nice break from my usual trail. On Thursday I ran 3 miles around the house but that wasn't too great b/c I was tired from the day and went at night but at least I got it in. Today (FRIDAYYAY!) I took a rest day and got some errands done, and went to the GAP to donate an old pair of jeans for new ones. Well I didn't know my size since I hadn't bought any in awhile and I am now a SIZE 4! I almost cried in the dressing room..I think the last time I could fit into a pair of slim size 4 jeans was in middle school, no joke! It felt really good and was a nice treat for all the hard work I've put into getting my body back into shape and eating healthy. I kind of forgot how nice it is to fit into clothes that are form fitting and not tight or taking an hour to find a pair of jeans that don't make you look or feel fat. I am so used to being in either workout clothes, pajamas, or just loose comfy fitting clothes that when I was shopping today for clothes to go 'out' in I was like wow I love shopping again!!!! Anyways, had to share because it really cheered me up today! Well I hope you all hav a great weekend. I was talking to this gal I follow on Twitter from Nike about how I think I might have plateau since I haven't lost really anymore weight. Looks like I'll be adding in more fullbody weight training & a day of sprint runs to see if I can get things going again :) Either way I'm happy with how I look and a number doesn't really mean much to me anymore...tty soon xo! Well hello there! I'm sure you've all missed me - I'm baaack and with some updates ;) Well last Saturday I ran a mile just to warm up and did some strength training, and I realized I need to do it a little more because I had to go down in weights. That's okay though because I'm trying to tone up and you don't need to be lifting 15lbs to do that, so I'm down to my 8-10lbs and it's resistant enough for me. On Sunday I ran 5 miles and I stopped for a few seconds about 3 times and I still had a good time - under 50 mins and I'd like to keep it that way, lol! On Monday I took a much needed rest day and hung out with my family :) Tuesday I wanted to change things up a bit so I did 2 miles worth of sprints and my fastest time was 6:55s which is a-amazing! for me at least! and then came home and did Tone it Up's ab routine. Today I ran 4 miles and it was a little challenging because it was hotter than heck and I did a new route, which was nice but there was no shade so I stopped like 4 times to catch my breath. I did it under 40 mins so it wasn't too bad but I really wanted to only stop once if need be. Well since my shoulders are burnt lol, looks like tomorrow will either be a run indoors or strength training..indoors lol! Talk to u guys soon! Here's a pic of me after my 5 miler - i had sweat burning my eyes so I'm giving the stink eye kinda lol..
Well before I give you guys the 'GOODS' lol, -HAPPY NOVEMBER 1ST! I personally am more of a Dec. fan but I love Thanksgiving too, so happy happy joy joy :) OKAY !!! SOOO HOW DID I DO YESTERDAY!?! Well I can tell you that I finished! YAY AAAAANNNND I HAVE A NEW PR! 51:20s! !Granted it's not like this big amount but shaving over a minute off is fantastic!! So I'm thrilled, so here's how it went ---;) Well some of you may know I've been on a painful blister kick this past week and a half and was really worried I wouldn't be able to run this 8K this past Sunday b/c I haven't ran in almost a week. I've never gone that long without running and so I was nervous. The good thing was the blister was gone by Sunday but I had doubts coming in and out of my head that I wouldn't be able to a)finish and b) beat my previous PR time which was 52:23seconds. To make a long story short in the beginning of the race I paced myself, I wanted to go fast but I didn't. Once I got to mile 3 I picked it up and I didn't stop for water - I had hydrated myself enough the past 2 days before that I felt fine to not stop. Mile 4 came and I went even faster, I got the 'runner's high' and I realized that I was running pretty fast and I was mentally thinking 'slow down you're gonna burn out' but I didn't, something inside me said to 'keep going you're going to be fine!' Then "whip my hair" by Willow Smith and booooiiiii that made me go even faster! I was .5 miles away and I was sweating like crazy, where my blister had disappeared was starting to say hello again, but I pushed thru it anyways and once I saw the 'FINISH LINE' I went as fast as I could. I never felt such power in my legs, and the cheers of people was great and empowering. I looked at the clock as soon as I went under - 51:23 seconds!!! I beat my PR time AND I finished..it was a good day ;) Thank you all for the positive vibes and encouragement this past week..you know who you are..it brought me goodluck and I'm grateful :) xo. Hi folks, hope you all have a fantastic week, here's an update of what I've been doing :) On Thursday (11th) I ran 3 miles, pretty easy now those three milers ;)- On the (12th) took a rest day..weeee!! On Saturday (13th) did an amazing total body workout that I found from my Shape magazine that even had my sister in law sweating and with deep muscle soreness the next day, felt great! On Sunday (14th) I RAN 8 MILES WHOO HOOO!! Now it took me an 1hr and 15 mins but I think it would've been less if my new Lululemon skort wouldn't have been chafing a little on my right inner thigh :( Had to keep pulling it down and stopping - very annoying and it started around mile 5 too. 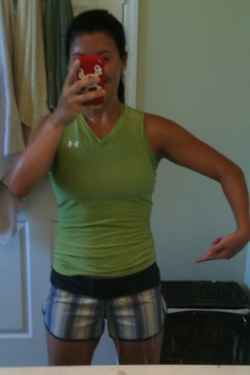 Learned my lesson of a)don't try new workout clothes on a long run and b) don't wear a skort running long distances lol. Either way I love it and I bought another one too in a different color but I'll wear for either strength training or casually. 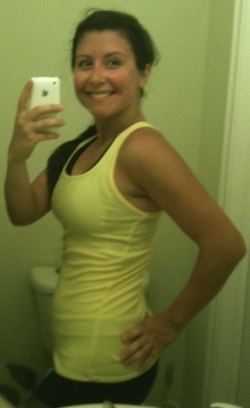 So back to my run, it felt great, I took my time and I felt like I really CAN do this half marathon in January!! Since I'm training 2 weeks ahead of my training plan I am going to do this last week's training plan again for this week, just so I'm not ending too soon. It's less than 8 weeks away now - the race - and I couldn't be more excited!! :) Hope you all are being active before the snow kicks in..if it hasn't yet in your area. toodles, xo. WOW, alot has happened just in the past week but I'll summarize it up for you guys. Well first off on the 20th I did a fullbody workout and went for a mile walk. On the 21st I went for a 7 mile run with my sister in law and it went great however I had some stomach pains afterwards for about an hour. 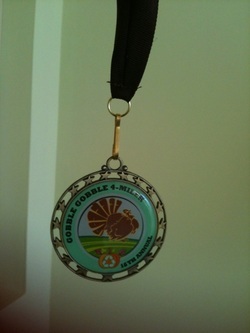 On the 23rd I ran just 2 miles since the 4 miler race was on the 25th. Then came THANKSGIVING! which I hope you all got to enjoy. I did the race in the a.m. and it went superb I couldn't be prouder of myself, I went nonstop and finished under 39 mins which I had never done before. The bad news was once I got home I got severe stomach pains to where I ended up being rushed to the ER, and after doing many tests they found a cyst on my ovary that was causing the pain. I'm thankful that it's not cancerous, dangerous and can be removed if I want to keep running, what makes me sad is that now that I finally can run long distances and was less than 2 months away from the half marathon, I don't think I'm going ot be able to do it. I can't run until it's removed and even after that I'l need a couple weeks of recovery time. I don't want to think that all this training I've done is for nothing because it helped me get in shape and there is another half in March I can do too. It's just that I love it so much and I've gotten used to running everyday that not being able to just well stink! I just hope when I can again my body will bounce back and not hate the process! In the meantime I just started doing light workouts the past two days (27,28th) and take it easy. Since they put almost 3 bags of IV fluids in me I gained 5 pounds but I've already lost 3 since it's all water weight anyways I'm not too concerned. 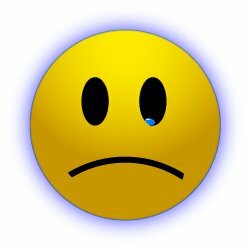 So that's what I've been up to, I had a race planned on Dec.11 but that's cancelled as well :( Pray for me and hope that all turns out well. I'll keep this updated to see what workouts and how it's going so far for you guys too :) xo ~ staying positive. SORRY! I'm sorry I've been slackin' big time on here but I did try to get on last night and the site was down :( Sooo much to catch up on! Well first off as you know I haven't been able to run since Thanksgiving which has been stressful & frustrating BUT I have found other ways to staying fit in my own capacity. So on November 30th I did some strength training which felt really good - good circuit routine! on December 1st was the first time I did straight cardio so I kept it light at only 30 minutes on the elliptical. On December 2nd, I did 45 minutes but on the stationary bike with moderate intensity and felt fine. On December 4th I did a fullbody workout and 30 minutes of cardio on the elliptical - THAT felt really good since I was sweating hard and I felt like how I did after my runs. ON Dec. 5th I did only 15 minutes of elliptical and 15 minutes on the stationary bike - worked up a sweat but not out of breath. And TODAY,the 7th, I did BIKRAM YOGA - one word; AMAZING. I had heard from all sorts of people that it's torture, you can't breathe, you want to run out of the room, you are sweating like a beast, don't breathe thru you're mouth or you'll think you died...all this stuff!?! Finally my Lululemon manager asked me if I wanted to go with her to a class and then a few other girls wanted to go too so I was like awesome, good support group! Well b/c of schedules and stuff only my mgr. and I made it -I got there a little early so I could go into the heated room and relax a little and it helped. The whole 90 minutes session was amazing I did my best at every pose and only one I didn't do because I got lightheaded - the camelback - pretty hard, it's where you open youre chest out completely and tilt your head and arms all the way back. It did get extremely hot, I did sweat like a beast, but I let myself remain calm, I thought this is for me, don't let it scare you..this is good for your mind & body. At the end the class gave me a big round of applause for staying the whole time and giving it my best and that made me feel good. My mgr. was like oh my gosh, you look like you've done this for years!?! I couldn't believe it myself I told her! Either way I highly encourage anyone to go and let go of all the prenotions you've heard about it and try it for yourself. I promise i will go again and again since I can't run and this will help me become flexible b/c I'm not at all right now!!!! I hope this post gives courage to those who are afraid to try it b/c I was too. Namaste xo. Sorry I haven't been on here - I've tried multiple times to log stuff and this stupid thing would not let me!!!! I finally had to send out an email to Weebly to get me to help me out, apparently they've fixed it! Anyways - how ya been my peoples!? I'm doing alright, still working out and staying busy with the holidays - who isn't, right! So here are my workout updates :) 12/9; Tone it up circuit video full body 3 x's, 12/10; Power Vinyasa yoga -first time and it was harder than bikram! alot of challenges but I liked it! 12/11; fully body workout and ran 1.2 miles (since the doc gave me the ok I'm taking it slow. 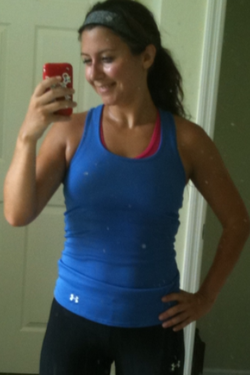 12/12; Ran 2 miles and it felt great -I even sprinted a few times..it was hard not to!! 12/14; Ran another 2 miles but it was a bit challenging because there was alot of wind last week! 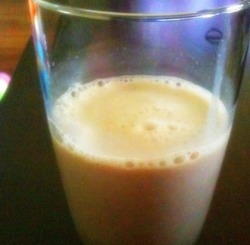 12/15; ran 3 miles and it's gotten back to being warm so it was good - I refuse to run at the gym. I don't want to get used to running on a treadmill, I like being outdoors and it's harder too heehee. 12/16; ran another 3 miles - no pain since I've started back up so on Sunday 12/18 I'm doing 4 miles. Today 12/17 did a plyometric workout 3 x's via tone it up and they're ab workout 2x's and 30 mins. on the elliptical. All in all I feel fine I don't have any pain and I have been back and forth on whether I should tuff it out and do the half marathon in 3 weeks. My family thinks I should take it easy, slowly get back into it and just do the next half that's slated for early March. I don't know we'll see..it's just that when you have a goal to accomplish something and you don't, it can really get you down and that's what is troubling me :( Any advice or suggestions feel free to share. nite yo xo. Well the days are counting down until we are in the new year, whoohoo!! Here's what I've been up to last few weeks. I can honestly say that I worked out thru the holidays, and I'm proud of that! Now as fro my eating that's another story, but it comes only once a year so I'm not going to guilt myself to death! On 12/19; I arn 4 miles, timed under 42 mins. not too happy with that since at my last race (xgiving I did it under 39) but it's okay! 12/21; ran 2 miles, 12/22 ran 3 miles, 12/23 ran 1.05 miles and got strong pains in my lower calves/shins, had to walk home and take a rest from running - it's because I haven't been stretching! 12/25; yep even on xmas day I worked out lol did the Tone it UP circuit training and shoulder and just a run around the block. did this with my sister in law so it was fun :) On 12/26 ran 1.15 miles then it started to rain! so went to the gym and did a tone it up full body circuit 3 x's with my 2 sister in law's..they called me drill sergeant rest of the day lol. The last 2 days I've rested b/c my legs need it but tomorrow 2-3 miles before I head into lululemon :) Hope you all have a wonderful New Year's and please be safe out there! Don't drink & drive :) xo. So for some reason Weebly is being weird and has my last two posts flipped so scroll up a bit if you want to see what I've done since the New Year! I have a load in the laundry that needs folding and dishes to put away so this is going to be short and sweet..as always ;)- 1/13 ran 3 miles, 1/14 did 1 hour of power yoga (felt soo good), 1/16 ran 8 miles (wasn't hard just took my time and it was nice out). 1/17 did 1 hour of power yoga (which I do vinyasa flow if you were wondering at a local studio), 1/18 ran 1.5 miles with my daughter (wasn't long at all since it was pretty cold out), 1/19 ran 3 miles fast pace. 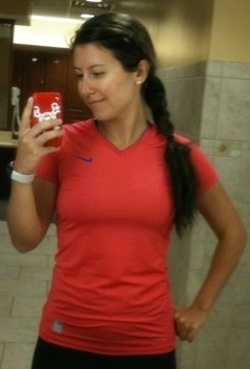 1/20 ran 2 miles speed intervals, 1/21 1 hour power yoga, 1/22 Nike training club 'adrenaline rush workout' and a 20 min. walk (if you can download the app DO IT - it's free and awesome!). 1/23 8 mile run, 1/25 2 mile run fast pace, 1/27 3 mile run medium pace, 1/28 power yoga. 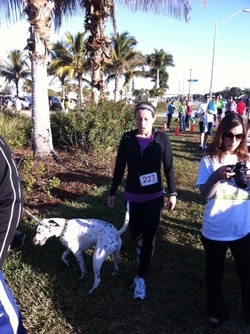 1/29 did a 5K race for the Humane Society called Run for the Paws - so fun, I don't have a dog but about half of the 600 runners did so we were running alongside :) Super fun and that is what the pic above is me after the finish, didn't PR -was 30 seconds short but it was hard with the dogs, and the trail was very narrow. 1/30 ran 9 miles (was hard mentally, last 2 miles I had to stop 2 or 3 times and walk for a few seconds but I finished it!) 1/31 REST DAY! So that's what I've been up to these past few weeks. Working out hard and increasing mileage and endurance for the Half on MARCH 6!!! I feel like I'm getting there..slowly but surely :) xo. Yo! So I just got back from a 2 mile run doing sprint intervals, whew that was tough! So for the last 10 days I've really been focusing on my running since the half is only 3 weeks away..YIKES! So on 2/1 I ran 2 miles and did 100 situp/pushups, 2/2 ran 3 miles, 2/3 40 min vinyasa flow yoga, 2/4 strength training circuit 3x's thru. 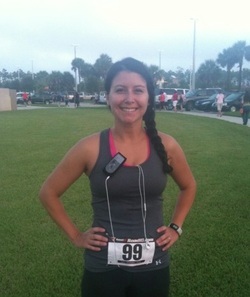 On 2/10 I RAN 10 MILES *never8 had I done that before, it was a great feeling :) 2/7 ran 2 miles and 2/8 ran 3 miles. I want to write more but the baby is awake from her nap, so I'll get back on here soon ;) xoxo! Whoa! 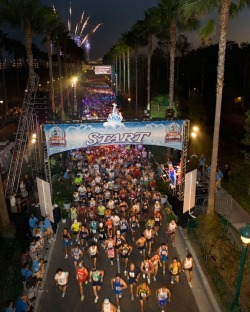 So I could totally enter a post from Feb. 18- now but I know most of you just want to hear about the half marathon lol! So I decided to skip to the day prior to the race to now, how's that :) The night before I felt surprisingly calm, I went to the carnival with my family and was in bed by 9pm, I slept good and felt confident. I woke up at 4:45am to eat 2 egg beaters, 2 slices turkey bacon & slice of toast with PB, it's what I always eat before a long run and they say never change it up so I didn't! Once 6am hit, I started feeling butterflies in my stomach, I couldn't believe it was here. My sister in law picked me up and we parked by 6:40am, enough time to well use the bathroom really lol. Then we jogged to the starting line and stretched a bit, then before it hit 7am, I said to her, "this is it, what we've been training for this whole time. We can do this!" and then the flare went off and the cheering began! 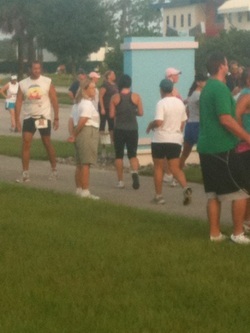 Sun was peaking up and with over 1,200 runners I stayed at my 10:10 pace and waved at the crowd cheerfully. I wasn't in this to finish first, I was doing it to enjoy the moment and have fun! The first few miles were easy, I kept my steady pace and just kept looking on. When I got to mile 6 it started getting cloudy and I felt raindrops on my arms, ah hell I thought, I hope it doesn't rain. Two seconds later the drizzling started, I had my sunglasses on and I kept them on for as long as I could until I had to start using my fingers as wipers! So I put them on my water belt praying they would stay on there. Mile 7 came - the bridge- the highest bridge crossing from Fort Myers to Cape Coral, a mile long each way. We'd have to go up and then down and turn around and do it again! I misjudged how hard this bridge was, my pace slowed down but as I was going up and seeing my fellow runners who were already heading down, their faces of determination it gave me a boost. I kept going, I didn't stop and when I was already heading back up the bridge, seeing the people coming up with their faces the same way I had mine, had me yelling, "it gets easier, you can do it!" So once I was finally off the bridge it was mile 9, and the rain finally let up thankfully!Then I thought hey, only 4 miles left - I GOT THIS! once I hit mile 11 I started getting a little fatigued, that bridge took alot outta me but I was going to keep going! Once I got to mile 12 I had to stop a few times and get some water in, it felt like the finishline was soooo far away!!! 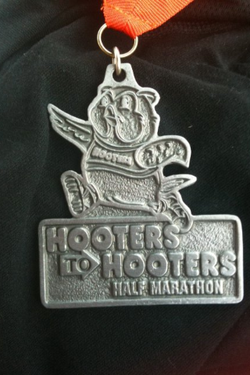 I was with a pack of runners who were in the trenches with me, one lady (dressed up in a Hooters outfit, it was a Hooters half marathon :)-) said come on we're almost there! So I started to run fast when I heard yelling, I looked behind and it was a guy holding my glasses, damnit* I thought, i thanked him and just held them, at least I had the leg and only was missing the screw. I just started running as fast as I could, I saw the FINISH banner and people on the sidelines, yelling 'PUSH, YOU CAN DO IT', 'COME ON, GIVE IT ALL U GOT', and I did - crossed that line under 2:28:10. then my legs said STOP! 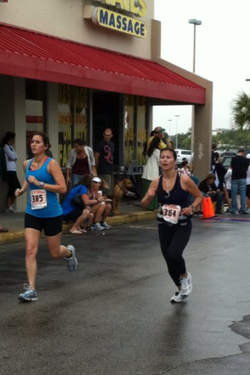 So I did ;) my sister in law ended up catching up to me and crossed the finish at the same time (pictured above). It was the best feeling in the world and seeing my husband and babygirl congratulating me and telling me how proud he was, made is so worthwhile. To those of you who don't think you can do it, I'm telling you YOU CAN. 90% of it is mental, get that negative poisen out of your mind and be confident in yourself. There was a woman who finished it at 1:37 in a wheelchair - that was astounding to me. Nothing is limitless, get out there and get it!Oh and by the way, my next half? 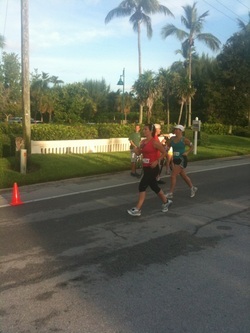 October 29,2011 - Halloween Miami Beach Half Marathon...oh yeah..BRING IT!